Item description: Entry, dated 25 October 1863, from the dairy of Samuel A. Agnew. Agnew describes a church service and news from engagements in Tennessee, Georgia, South Carolina, and Virginia. 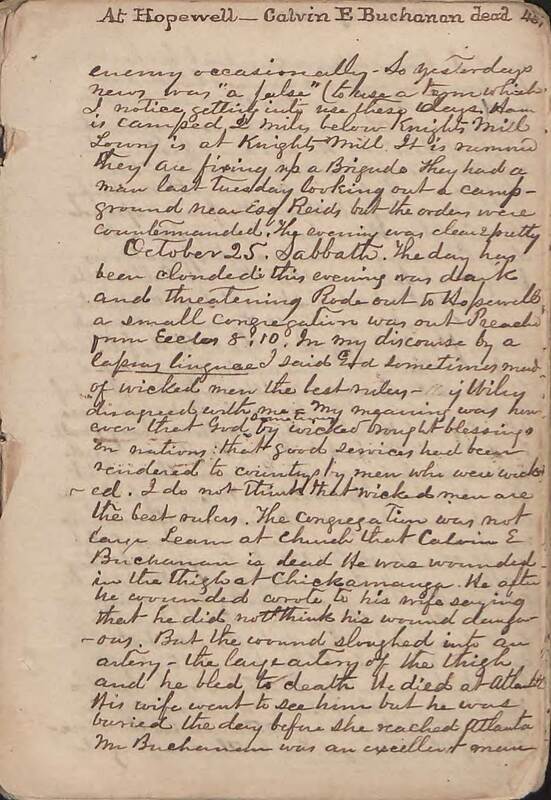 Item citation: From folder 9 of the Samuel A. Agnew Diary, Southern Historical Collection, Wilson Library, University of North Carolina at Chapel Hill. October 25. Sabbath. The day has been clouded this evening was dark and threatening. Rode out to Hopewell a small congregation was out. Preached from Eccles. 8:10. In my discourse by a lapras linguae I said God sometimes made of wicked men the best rulers – [Maj.?] Wiley disagreed with me. My meaning was how ever that God sometimes by wicked brought blessings in nationas that good services had been rendered to countrys by men who were wick-ed. I do not think that wicked men are the best rulers. The congregations was not large. Learn at church that Calvin E. Buchanan is dead . We was wounded in the thigh at Chickamauga, He after he wounded wrote to his wife saying that he did not think his wound danger-ous. But the wound sloughed into an artery – the large artery of the thigh, and he bled to death. He died at Atlanta. His wife went to see him but he was buried the day before she reached Atlanta. Mr. Buchanan was an excellent man and I have often a guest at this house. He leaves a wife & 2 young children to mourn their loss. Mr. B. was a member of Hopewell Church and for some years the clerk of Sessions. He was an affectionate child. His aged mother now says “her stuff was broken.” Dine with Mr. Snipy and rode up to Aunt M.P.s and spend the night. Have heard some items to day. 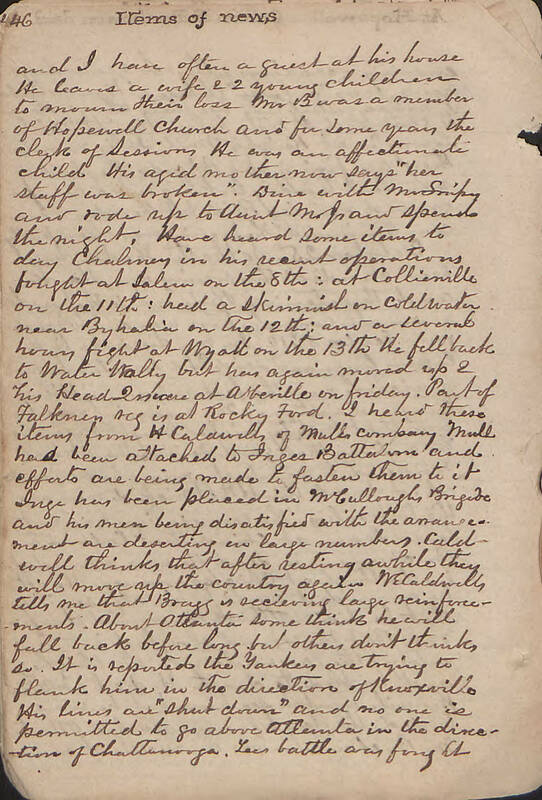 Chalmey in his recent operations fought at Salem on the 8th: at Collierville on the 11th: had a skirmish on Coldwater near Byhalia on the 12th: and a several hours fight at Wyatt on the 13th. He fell back to Water [Holly?] but has again moved up 2 his Head 2 more at Abbeville on friday. Part of Falkner reg is at Rocky Ford. I heard these items from H. Caldwell of Mulls Company. Mull had been attached to Inges Battalion and efforts are being made to fasten them to it. Inge has been placed in McCullough Brigade and his men being disatisfied with the anounce-ment are deserting in large numbers. Caldwell thinks that after resting awhile they will move up the country again. [W. E.?] Caldwell tells me that Bragg is receiving large reinforce-ments. About Atlanta some think he will fall back before long but other don’t think so. It is reported the Yankees are trying to flank him in the direction of Knoxville. His lines are “shut down” and no one is permitted to go above Atlanta in the dire-ction of Chattanooga. [Last?] battle was fought near the old Manassas battle ground. There was a fight at Charleston on Tuesday. 425 Yankees were captured. Richardson’s brigade is at Cherry Creek. [Loring’s?] Division is about Jackson in this state at this time. This entry was posted in Southern Historical Collection and tagged Atlanta (G.A. ), Battle of Chickamauga, Charleston (S.C.), Chattanooga (T.N. 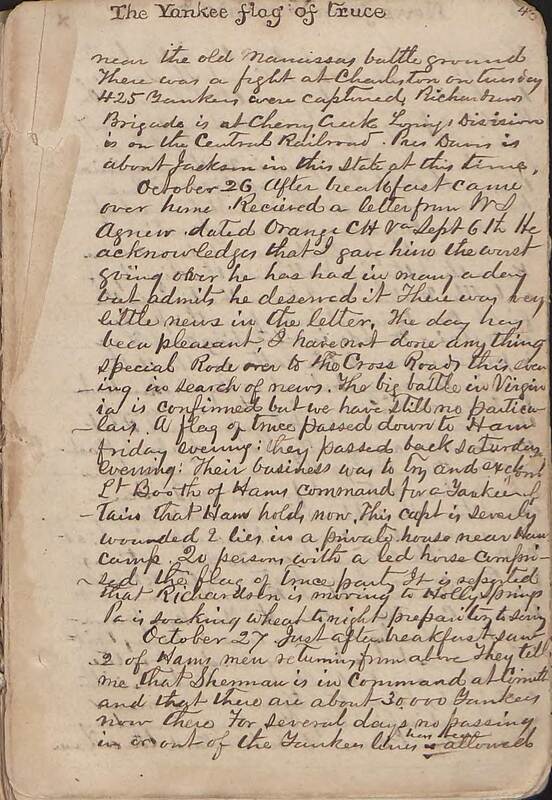 ), church attendance, religion, Samuel A. Agnew, wounded soldiers. Bookmark the permalink.